A new study in the Journal of Urban Ecology, published by Oxford University Press, indicates that the number of wild animals killed by motor vehicles may be much higher than is generally reported or understood. 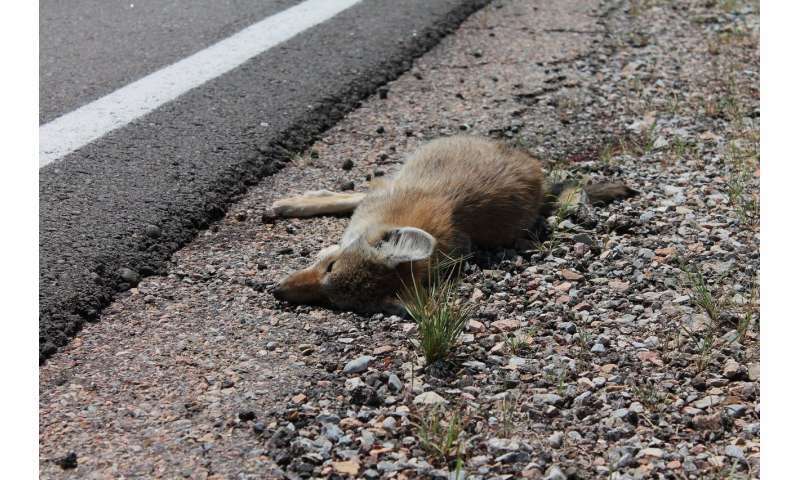 Roads can have negative impacts on wildlife through direct effects such as fatal collisions with vehicles and through indirect effects such as changing and fragmenting animal habitats. There are millions of wildlife deaths on British roads every year, and the resulting carcasses represent a substantial amount of food for scavengers. By removing roadkill in urban areas, scavengers perform a valuable ecosystem service, but the rapid removal of these carcasses by scavengers could lead researchers to underestimate the impact of roads on wildlife. In order to evaluate the scale and context of urban roadkill scavenging, researchers here examined which species scavenge on roadkill in urban areas, the likelihood of roadkill being removed by scavengers, and whether spatial and temporal factors (such as location and time of day) influenced the rate of removal. Researchers deployed camera traps baited with chicken heads to simulate roadkill corpses in six residential and six parkland sites in the city of Cardiff. Seven species were observed removing the roadkill, with corvids (members of the crow family) being the most common scavengers, responsible for 42% of removals. Of the 120 corpses, 90 (76%) were removed within 12 hours. Time of day had a significant effect on the rate of removal, with the number of carcass removals peaking in the first few hours of daylight. Of roadkill placed at 9 AM, 62% of carcasses had been removed after only two hours. Removal of corpses by scavengers could mean that the actual number of road deaths is six times more than that observed during surveys. Seven species were observed removing the roadkill; two species of gull, carrion crow, Eurasian magpie, red fox, domestic dog, and domestic cat. Corvids were the most common scavengers, responsible for 42% of roadkill removals. In addition to the observed removals, mice, likely wood mice, and a brown rat were observed scavenging on the bait, but did not remove it. Of the observed scavengers, birds scavenged most frequently, with 51 incidences of roadkill removal, compared to 28 by mammals. There was a significant difference between residential and parkland habitats in the relative frequencies of the different taxa scavenging the baits, showing that the likelihood of a particular animal scavenging the bait was dependent on the type of habitat. For example, gulls fed predominantly in residential areas (12 incidents compared to only once in parkland), whereas corvids mostly fed in parkland areas (28 incidents compared to 10 in residential areas). "Removal of animals by scavengers is believed to be the most important factor causing underestimations of roadkill numbers, particularly of small animals such as garden birds and rodents," said the paper's lead author, Amy Williams Schwartz. "Our study demonstrates the frequency and speed at which scavengers can remove roadkill, and the extent to which we could underestimate the true number of casualties, but also suggests that many urban scavengers such as crows, gulls, and foxes could be providing an under-appreciated and largely unnoticed carcass removal service in our cities."